John Bitove was a Canadian businessman of Macedonian origin. He was born in Toronto in 1928 to Nikola and Vana, who came from the Macedonian village Gabresh located in today’s province of Western Macedonia in Greece. Growing up in a family that carried the scars of persecution and suffering had impressed in John Bitove a sense of patriotism for Macedonia and deep love for the Macedonian people. This love became the force that compelled John to dedicate his life to his beliefs and ideals of helping Macedonia and Macedonians across the globe. It was his strong will that enabled him to grow into a successful businessman. John Bitove will remain as one of the few Macedonian heroes of the modern day. He believed in freedom, justice and the ability for all Macedonians to enjoy basic human rights in the states across the Balkans. He donated funds to many organizations helping Macedonians who in need. A number of Christian churches have been built thanks to his support- most recently the Saint Mother of God in Cambridge and St. Elijah in Mississauga, both in Canada. John Bitove was also a strong believer in education, which compelled him to initiate the learning of the Macedonian language at the University of Toronto. Mr. Bitove has provided scholarships to exceptional students of Macedonian origin in North America. John married his American-Macedonian wife Dotsa in 1949. They were together for 67 years until his death. John and Dotsa Bitove founded the Canadian-Macedonian Place in 1978- a retirement home for over 100 Canadians of Macedonian origin. Canadian-Macedonian Place organizes one of the oldest Macedonian gatherings in Canada- the Macedonian Open Golf Tournament that started in 1942 and has been taking place each year to this day. John and Dotsa were deeply impacted by the experience of the children-refugees of Macedonia from the conclusion of World War II, who are known as the Detsa Begaltci. Both of them had relatives among the 30,000 Macedonian children who were sent to the countries of the European Eastern Block to escape persecution and death in their native country. John and Dotsa organized and paid for the reunion that took place in Skopje, in 1984, to re-unite them with their families. This event became a landmark in the latter-day history of the Macedonian people and led to many more Macedonians to reunite with their brothers, sisters, relatives and friends. In 1991, he organized, fundraised, and led an international campaign to compel major countries to recognize the Republic of Macedonia as an independent state. He was very proud that the country gained its independence without a single bullet fired during the turbulent dissolution of Yugoslavia. 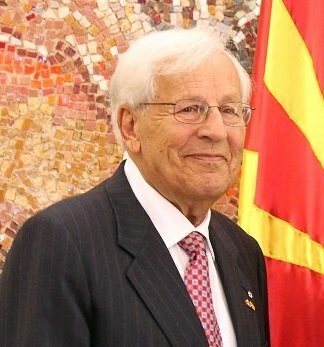 John Bitove initiated the idea that the Macedonian Diaspora should have an organization of professionals that will work to promote economic development in Macedonia. This resulted in the founding of Macedonia2025 by his son John I. Bitove (Jr.), Mike Zafirovski, Mitre Kutanovski and other notable Macedonians in the diaspora. The organization grew to become the foremost entity of Macedonian professionals from all over the world who are doing their part in helping Macedonia become a better and economically stronger country. John Bitove Sr. proudly served as an Honorary Member of Macedonia2025. John Bitove’s dream as a child – that one day there would again be a country for the Macedonians – has become reality. His help in this achievement and his help for Macedonians is the legacy that he left behind, and he will be dearly missed. John Bitove has received numerous awards and recognitions. He was decorated with Canada’s highest civilian award, The Order of Canada, as well as the “September 8th Medal of Honor,” the highest merit awarded by H.E. Dr. Gjorge Ivanov, President of the Republic of Macedonia.